The A & R Demolition, LLC management team has overseen more than 1250 demolition projects, 225 site work projects, and over 900 hazardous material abatement projects with multi-state experience in operations and project coordination. With extensive experience and know how, A & R Demolition, LLC operates like a fine-tuned machine with a family oriented environment. As we continue to strive to meet and exceed the needs and expectations of the growing demolition industry, no job is too big or too small. ​We consider the landfill our last resort. We have made it our mission and sole business practice to reduce, reuse and recycle absolutely every piece of debris from within our demolition projects. When you bring A & R Demolition, LLC onto the job, you’re not only getting the job done right, you’re doing what’s right for the environment. 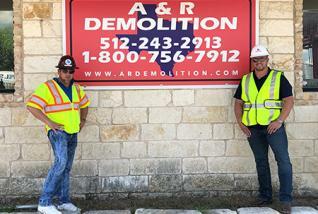 AUSTIN - Recycling is part of their demolition process. “We [deteriorate] everything from the landfill that we can and recycle as much as possible,” said President of A&R Demolition and Heart of Texas Demolition, Stephen Reveile.